A British machine-gunner firinig his Lewis Gun as if it were a rifle, no doubt at some hastly-presented target. Firing the Lewis Gun in this fashion was usually inaccurate. 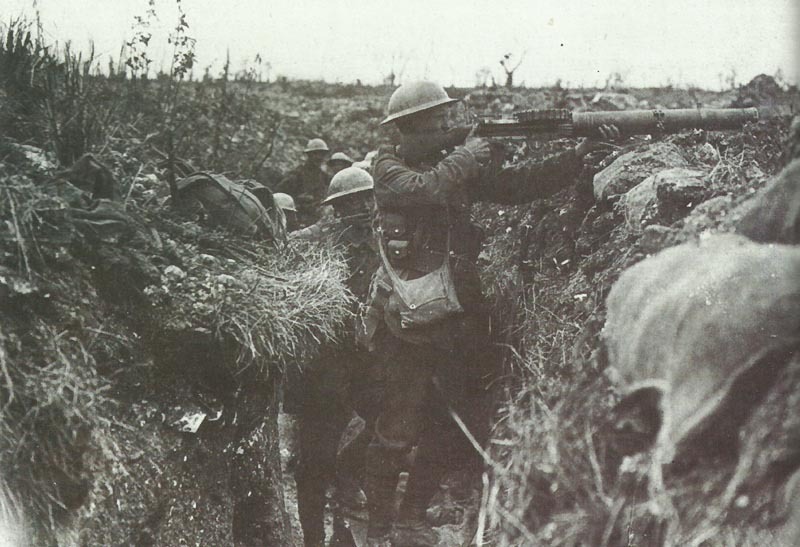 Battle of the Somme: British secure Delville Wood and repulse attacks south of Thiepval. Champagne: German attack west of Tahure repulsed. Ypres: New 4th Canadian Division arrives. Dobruja: Russian Dobruja Detachment (50,000 men in 3 divisions) crosses Danube into Rumania, invades Bulgaria (August 27). Macedonia: Bulgars occupy Seres in northeast Greece. North Sea: German coastal submarine sinks armed boarding steamer HMS Duke of Albany.